Sofitel Philippine Plaza is one of the best luxury hotels in Manila, famous for their lagoon pool and resort setting, with a view of Manila bay. Sofitel’s Spiral buffet restaurant is also a favorite in the metro. Another restaurant of the hotel is Le Bar, a combination of bar, bistro and patisserie. But what pulls me toward Le Bar is their Pastries. Galette Patisserie and Chocolaterie is a French pastry shop with stunning cakes and luscious chocolates. First, the designs are upscale with exceptional decoration, usually a gold leaf or chocolate adornment shaped like a heart, spiral or random squiggle lines. The drawbacks of these lovely cakes are the price and the size. Approximately only 4 inches in diameter, the cakes are priced at P175. I’ve got my eyes on Galette’s hazelnut cake and lemon tart but I’m internally debating if the 2 petite cakes are worth my P350. After a few minutes, I bought the 2, thinking that it’s not every day that I have the chance to visit Sofitel. When the bill came, I was surprised to see that it was just P170. I asked the waitress if she gave me the wrong bill and she just said that the cakes are discounted starting 7pm. I told my sister this, and she bought 3 more cakes and 2 pastries. Hazelnut Mille Feuille. P175. Mille Feuille or “thousand-leaf” is made of layers of puff pastry with hazelnut cream in between layers. I love hazelnut so I’m a bit biased on this one. The layers are crunchy and the in between is more like gooey in creaminess. It’s a little too sweet but still good. The dark chocolate on top balances the sweetness of the entire pastry. Dame Blanche. P175. “White Lady”, a white chocolate cake topped with curtain-like fondant with gold leaf and sprinkled with cocoa, is one Galette’s bestsellers. The whole cake tastes like Toblerone White. Lemon Tart. P175. This is delicious except for the meringue which is too sweet. I threw half of it away. If they town down the meringue’s sweetness, this would have been my favorite. Mocha Éclair. Of all the pastries we bought, this is the least I like. The icing is too sweet, I didn’t have the luxury to savor the flavor. Canele. P60. A French pastry shaped like a striated cylinder with a soft and tender custard-like center. 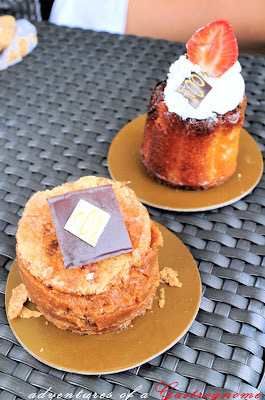 Canele's taste similar to bread pudding except that Canele's has a hint of rhum and its outer layer is thick and caramelized. In addition to the cakes, we also bought Croissant, Banana bread and a Peach pastry. Also check out Galette’s truffles and chocolates. Galette’s have unique and weird fusions of chocolate, several flavors have alcohol content. Some have a Filipino or Asian feel which I’m curious and a little scared to try. Flavors include Salabat Praline, Yema Cashew, Sesame Wasabi Praline, Basil Praline, Honey Praline, and more. P55 apiece. All in all, experience at Galette’s is pleasing. Though only a few bestsellers were left when we ordered, we still had a good time. You can find Le Bar’s Galette on the right side of the lobby. Sofitel is located at CCP Complex Roxas Boulevard, Pasay City.